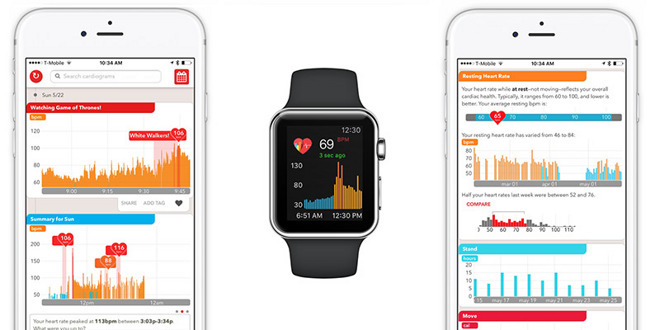 HealthKit-enabled Apple Watch app Cardiogram has received its 1.0 release, bringing native watchOS 2 compatibility, 3D Touch for supporting devices, and a redesigned interface. The app has been developed in collaboration with researchers at the University of California San Francisco's Health eHeart study, which aims to help end heart disease. The program wants to develop a way to detect atrial fibrillation – a medical condition that can lead to stroke – using innovations in everyday consumer technology. By that token, the Cardiogram developer team have been refining an algorithm that attempts to detect abnormal heart rhythms using the Apple Watch's heart rate sensors. The 1.0 version of the app at the center of its efforts brings that goal a step closer, introducing native watchOS 2 support that enables users to track and view recorded heart rate data without having to tether their iPhone. A new Apple Watch complication also allows users to quickly view their latest heart-rate readings. Meanwhile, the iPhone companion app now includes comprehensive activity statistics and trending HRM data, along with a Metrics screen that brings together users' move, stand, and exercise goals. In addition, iPhone 6s and 6s Plus device owners can use 3D Touch gestures to tag peaks in heart rate, while social media sharing and interface tweaks make up the rest of the update. Anyone with an Apple Watch can take part in the eHeart study, since the algorithm learns from its users, whether or not they have preexisting heart conditions. Apple's HealthKit framework debuted in 2014, allowing developers to build health monitoring software that integrates with Apple's Health app, while Apple's open source framework ResearchKit was made available to developers in April 2015, enabling them to create their own iPhone apps for medical research purposes. Apple itself continues to have significant interest in making its Apple Watch part-medical health instrument. An Apple patent application recently came to light, titled "Care event detection and alerts", which envisions a hardware system with the ability to monitor the surrounding environment for events that would require assistance from medical professionals, police, fire rescue or other emergency services. Hey! I'm one of the Cardiogram developers. For all of you who had trouble registering, sorry about that—we had a big spike in server load overnight. I added more capacity, and am tuning the system now to make sure we can take the load as traffic comes in. I think also a lot of sporters are waiting for this. I just bought a heart monitor/sensor from Wahoo (Tickr X) and it works perfect without having my iPhone nearby, it registrates every beat accurate. Never liked the whole concept of wearing my smartwatch during sports. And there's nothing more accurate like a chest belt monitor. So far for the heart rate functionality on a smartwatch for me... Maybe a standalone Apple Watch 2 will change my mind. As I understand it, wOS 2 apps are supposed to run directly on the watch and independent of the phone. Pro tip: to avoid such trivial triggering Apple-related news, please try androidrumors dot com. This, coupled with enhanced sensors in the next gen watch (e.g. glucometer) could really make the watch a serious proposition. Ditch the fashion slant and instead go for health. This is a great app. I'm really glad it was brought to my attention. I've had cardiogram , kardia and the apple watch and the alivcor ecg for months. i wonder why this is front page news? I, and many others, have never heard of this. I'm interested. I'm very glad it was "front page" news. I hope web sites continue to post this kind of information even though it is obviously very distressing to those who already know about it. who is this even for??? All i see this leading to is more blood thinners -> more GI bleeds. Do you have any idea of who many people die from pulmonary embolus? Do you have any idea of how many people get severe and fatal hemorrhagic and non hemorrhagic strokes secondary to left atrial fibrillation induced clots? Do you know how many people get lower extremity arterial emboli with loss of limb or 4 days of TPA treatment which has it's own risks? Do you know how infrequent GI bleeding is with anti coagulant therapy and how in most cases it can be treated without much difficulty? Do you know what Protonix is? Just recall your statement when you have had your stroke, your face is contorted, you can barely speak, saliva is dribbling down the side of your mouth, but you have enough mentation left to say "if only I had known I had atrial fibrillation and had been on anticoagulation--this could have been avoided". this is an exceptional app though. I'm glad I found it through here. Right...you need to have it monitored all day..by the way how long does your watch and iPhone last? You are not having multiple pvc are you? That would be serious. I do not have the  Watch yet, still using a FitBit Surge. Cardiogram informed me last week I was in afib, I went to the doctor and had a 12 lead ecg. No new damage. My pulse was really high. Go ahead, put your life in Apple's hands.